The U.S. and Russia's human rights activists are troubled by a recent eviction of the For Human Rights organization from its office in central Moscow. After the Moscow authorities have evicted Russia's high-profile non-governmental organization, For Human Rights, on Saturday, human rights activists and the U.S. Ambassador to Moscow are expressing their concerns about the increasing human rights abuse in the country. Law enforcement agencies used force to evict the staff of a leading Russian non-governmental organization, For Human Rights, from its office in Maly Kislovsky Street in central Moscow early on Saturday, For Human Rights members say. "We were evicted from the office by force," Alexandra Bukvaryova, a coordinator for Human Rights, told Interfax. In forcing the organization's staff out of the office, security forces injured several people and broke some office equipment, she said. Alexander Cherkasov, the head of the human rights center Memorial, told Interfax police used disproportionate force against the people staying in the office. For Human Rights leader Lev Ponomaryov told Interfax security forces stormed the office after Human Rights Commissioner Vladimir Lukin left the scene. "There were only eight staff members in the office. 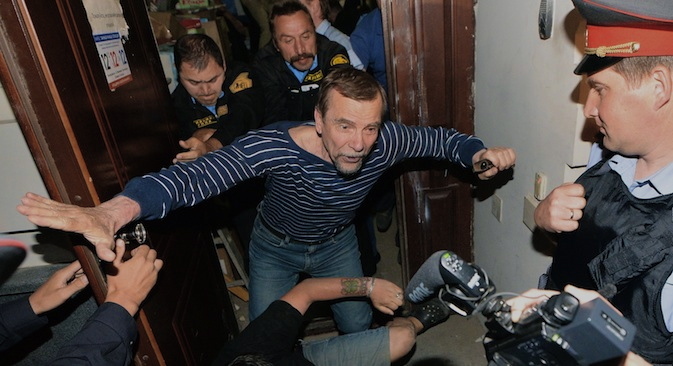 OMON [riot police task force] broke in and acted hideously brutally," says Ponomaryov, 72. "The OMON members dragged me down the stairs, and people in civilian clothing kicked me. They didn't even try to be nice either with me or with Moscow mayoral candidate [and Yabloko party leader Sergei] Mitrokhin, who had his leg cut," Ponomaryov said. He said those injured planned to ask for medical help. Will NGOs and Kremlin find a compromise amid inspections? Ponomaryov had no idea about how the NGO would continue its work after losing its office. "The first priority now is to evacuate our belongings from the office, as there is a lot of equipment there," he said. Meanwhile, Russian Human Rights Commissioner Vladimir Lukin described the eviction of the For Human Rights organization as "arbitrary." "We will discuss with lawyers how to react to what happened," Lukin told Interfax on Saturday. "Moscow authorities and police denied me access to the scene, which is a gross violation of the federal constitutional law on human rights commissioner. I will bring up this issue, and I have yet to think how this should be done," Lukin said. "Officials from the Moscow administration, the Interior Ministry and apparently some other organizations were trying to settle the dispute between two parties unilaterally, without judicial bodies, and therefore arbitrarily," Lukin said. At the same time, medical specialists have documented injuries that members of the non-governmental organization For Human Rights suffered as a result of the eviction from its office. "Seven people asked for medical help, and all injuries have been documented by medics. One of those injured was transported by an ambulance to the Sklifosovsky Emergency Medicine Institute," For Human Rights coordinator Bukvaryova said. According to her, people in civilian clothing supported by an OMON riot police task force stormed the NGO's office, claiming that the rent contract had expired and demanding that the office be vacated. "There was an assault last night. They beat elderly people. We won't leave this and will appeal to all possible organizations, including international ones," said Bukvaryova, who was among those who were evicted from the office. Bukvaryova said force was applied only to men, and she herself was not injured. Meanwhile, the Interior Ministry department for Moscow denies that police used force in evicting the staff of the non-governmental organization For Human Rights from its office. "Police officers were deployed near the office to ensure public order after the Moscow city administration issued written notification on this measure. Police did not take any forcible measures, and the eviction was carried out by a private security company," it said. According to the Moscow city police department, police officers did not detain anyone during the NGO eviction. "Police officers were maintaining public order during the Moscow city executive authorities' actions to free the premises unlawfully occupied by individuals and organizations," it said. The Moscow city property department claims that "law enforcement officers acted lawfully, because the premises occupied by the company no longer belonged to it." The city was protecting its property this way, a department spokesperson said. "The contract for renting the premises will not be re-concluded," he added. In the wake of the incident, U.S. Ambassador to Russia Michael McFaul expressed his concerns about reports on the seizure of the For Human Rights office. "The U.S. is concerned by reports on the forcible seizure of the NGO For Human Rights office - the last instance in a series of intimidations of civil society in Russia," McFaul said in Russian on his Twitter on Saturday. "Another instance of intimidation of civil society. We are concerned by reports on a violent seizure of 72-year-old @Lev Ponomarev's office," he said, referring to Ponomaryov. The Russian Presidential Human Rights Council is expected to hold a special meeting on Wednesday to address the For Human Rights eviction and it invites the Moscow mayor, the Moscow police department chiefs and the Moscow prosecutor to attend it, Human Rights Council Chairman Mikhail Fedotov said. "I should say that lawlessness is always like a single chain. Causes and forms of lawlessness may be different, but this doesn't change its essence," Fedotov told Interfax on Saturday. On Friday Moscow authorities are reported to demand that For Human Rights, one of the longest-operating Russian human rights organizations, vacate its office at 7 Maly Kislovsky Street, insisting that the rent contract had expired back in February. The organization refused to leave the office and called the attempts to evict them unlawful. The article is based on materials from Interfax.